What do I need to ride VAST trails? It's easy! 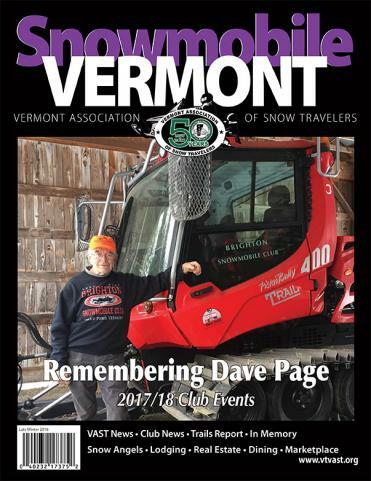 If you have a passion for snowmobiling and want to ride on the best trails in the Northeast, then the Vermont Association of Snow Travelers is for you! All snowmobiles, not legally registered in another state or province must be registered in Vermont. If you are already registered in your home state or province, you do not need to re-register in Vermont, but you must join a county and a local club and purchase a VAST TMA (see TMA Pass page for pricing information). Registration costs $28 for a Vermont Resident and $36 for a Non-Vermont Resident. Price subject to change without notice. Vermont State Registration Agents and DMV offices. All individuals operating a snowmobile in Vermont on the statewide snowmobile trails system, must have a liability insurance policy, or bond in the amounts of at least $25,000 for one person and $50,000 for two or more persons killed or injured, and $10,000 for damages to property in any one accident. Persons caught operating a snowmobile without the required liability coverage are subject to large fines. Six-hour safety course must be completed and passed by anyone born after July 1, 1983. Certified safety course: Individuals 12 years of age or older must have taken a certified safety course and carry that certification with them to be presented upon demand of a law enforcement officer. • The operator must take and pass an approved snowmobile safety course. • The safety certificate must be carried when operating and presented on demand of an enforcement officer. • The operator may operate on the Statewide Snowmobile Trail System (SSTS) and may cross a public road or highway. • While traveling across or on a plowed public highway individual must be directly supervised by an adult, at least 18 years of age. • The operator may operate on the SSTS and may cross a public road or highway. • The operator must be under direct supervision of a person 18 years of age or older at all times. The operator is exempt from taking a safety course. May operate a snowmobile on the VAST trail system without taking the safety course as long as they are under the direct supervision of a parent or legal guardian who accepts full liability for the child’s actions. The child is not allowed to operate a snowmobile on or across a plowed public right-of-way. • May not operate a snowmobile on the VAST trail system at any time. 8 – 11 year olds may attend a snowmobile safety course but will not be tested or receive certification unless they will be 12 years old on or before the last day of the snowmobile season (April 15). “Certified Operators” 16 years of age and older may operate without supervision. Speed: You must operate your snowmobile at a speed that is reasonable and prudent, taking into consideration current conditions, trail traffic and other hazards present on the trail. Vermont Law, Title 23, Chapter 29. The maximum speed limit on state lands is 35 m.p.h. The use of radar on snowmobile trails is becoming a standard practice. With the use of hand held radar guns, the enforcement of speed limits that are imposed on all state lands, has increased dramatically. Snowmobiles are subject to posted speed limits on public roads open to snow­mobile traffic. Vermont has a tough SWI law. This law covers both drugs and alcohol. While you will be charged with SWI on the VAST trail system, intoxicated snowmobilers operating on a public highway will be charged with DWI. As a result of this violation, you will be assessed points and your driver’s license will be suspended.? If you are involved in an accident, resulting in personal injury, death or property damage in excess of $500, it is your duty to stop and report it to local authorities. You must give your name, address, registration number and the name of the owner of the snowmobile to the party whose person or property is injured. You must also file an accident report with the Commissioner of Motor Vehicles within 72 hours. • Colored lens covers on headlights are illegal. • Windshields are mandatory or the operator must wear eye glasses, goggles or a protective face shield. • Helmets are mandatory for all riders on the VAST trail system. Efficient muffler and such other equipment and devices as may be required to meet the noise level specifications of not more than 73 decibels on the A scale at 50 feet in a normal operating environment. It is against Vermont law to sell a replacement exhaust system that exceeds the manufacturer’s original equipment specifications. Violation of this law will result in a fine of $500 for the snowmobile operator and a $500 fine for the person selling the illegal exhaust system. No by-pass of a muffler system is allowed. Sound pollution annoys many individuals and threatens the future of our sport.